We had the opportunity to review a Gillette Fusion5 Pro Shield Gift Pack. We'd also like you to hear about two awesome savings. For Father's Day Gillettes wants to remind everyone that they support the father and son relationship by encouraging guys to go "Go ask dad" They realize that finding a gift for dad on Father's Day isn't always easy. They want you to consider getting him their fail proof gift. Treat your dad to a simple and smooth way to reorder blades with On Demand . It is very easy, given the two options you have to order. 2. Subscribe online to get $3 off your first order, plus every 4th order of blades for free. Your subscription can be customized, changed or canceled at any time. 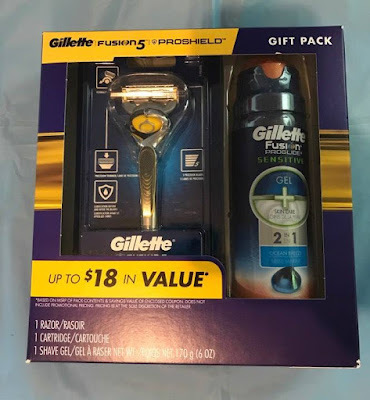 Starting June 6th, for a limited time only you can pick up the Gillette Fusion5 ProShield Gift Pack in-store at Walgreen's, for only $9.99 MSRP $18.. Help dad out keeping his face fresh with Gillette's most advanced razor and shave prep. Gillette Fusion5 ProShield men’s razor, comes with lubrication. before and after the blades. It features 5 precision blades for incredible comfort. With Gillette’s thinnest and finest blades. Complete with FlexBall technology, ProShield responds to contours & gets virtually every hair. One razor blade refill equals up to one month of shaves. This Fusion5 ProShield razor can be used with any Fusion5 blade refills. 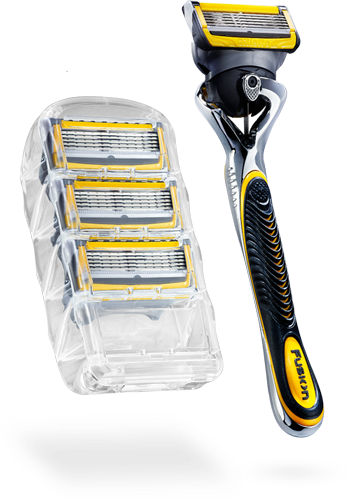 The blades you will receive from Gillette On Demand are the same razors you can buy from the store, but using this as a way to get your new blades is more convenient and simple. Besides every 4th order you get free, everyone likes free!! The blades will fit all Fusion ProShield, Fusion ProGlide, and Fusion Blades and all of the MACH3 Blades. Gillette blades will last about 30 days, but this will ultimately depend on how often you shave and your hair thickness. Gillette bases their 30-day claim on the average male shaver who shaves 3-4 times per week. Ensure a long-lasting Lubrastrip, store your razor in the included organizer tray or face up, away from damp surfaces. Treat that special Dad in your life to a fresh, smooth face! He'll thank you for it for weeks to come! We use Gillette razors in our home. I've tried others but we've always return to the razors that provide a better shave with less cuts. I love Gillette razors. ! I know my sons and their day only use Gillette razors like myself. The Gillette Fusion5 Pro Shield Gift Pack would make for a great gift idea for all three of them. The Gillette On Demand is an awesome way to get new blades as well as very convenient. Thanks for sharing the information. My husband loves these! I just wish that they would be on sale a bit more often. I have given Gillette shavers as gifts many times--they were always appreciated!! I tend to use Gillette myself. So much more economical then single use blades! !